It is finally here! Pope Francis' first encyclical, "Lumen Fidei" will be published on July 5, 2013. 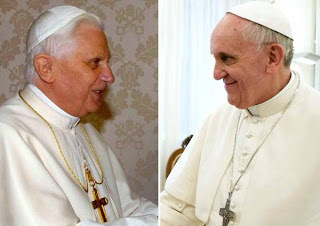 The encyclical was started by Pope Emeritus Benedict XVI and completed by his successor, Pope Francis. It was planned for the Year of Faith and would have completed Pope Emeritus' previous encyclicals that are on love and hope - the two of the Theological Virtues. Vatican spokesmen described this new encyclical as being short. I am looking forward to reading this new work of both Pope Emeritus and Pope Francis.